Being the most important part of your house, a compromised roof leads to much larger damage, such as mold. It’s vital that a roof be well maintained, repaired, and, when needed, replaced in order to keep the rest of your house safe and secure. If you want help now, give us a call at 910-302-5262 or fill out the contact form above. We’ll be glad to help. If you don’t know a thing about roofs, continue reading. This article will walk you through everything you need to know about roofing in order to make an informed decision whether it be to fix it yourself, hire us, or hire another company. 3 How much does a roof repair cost? 4 How much does roof cleaning cost? 5 How much does a roof inspector cost? 6 How much does a roofing permit cost? 7 How do you choose a roofing company? 8.1 What types of roofing systems are available? 8.2 What are the concerns with skylights during roofing? 8.3 How do I pick a shingle? 8.4 What are storm chasers? 8.5 What does a damaged roof look like? 8.6 When can I install roofing? 8.7 Where can I go to learn more about roofing? 8.8 What organization governs roofers? 8.9 Who are notable roofing manufacturers? 8.10 How long does a roof last? 8.11 What should I do if there is a leak in my ceiling? The average cost for a new roof in the US is $6,570. You have a 50% chance of having your roof cost anywhere between $4,557 to $8,687. Lower than that and you’re at the bottom 25% of roofing cost. This means you have a really small roof, are getting a great deal, or the estimate is way off. Higher than that and you’re at the top 25% in roofing cost which, if you’re sticking with asphalt shingles, means you must have a large roof, need major repairs in addition to roofing, or are receiving an overly high quote. This data came from a sample size of over 17,000 roofing jobs across the US. The average cost for a new roof in North Carolina is $6,111, lower than the national average but only by a little bit.. You have a 50% chance of having your roof cost anywhere between $4,735 to $7,836. Same rules apply if your bid is above or below this amount. This data came from a sample size of over 500 properties in North Carolina. Roofing prices are often quoted per square. A square is 100 square feet (10 feet by 10 feet). The steeper your roof, the higher the cost will be. The higher your roof (from base of roof to top of roof), the higher the cost will be. 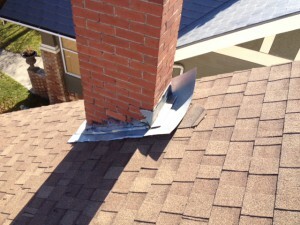 Obstacles such as chimneys, vents, and skylights increase cost. The more slopes your roof has, the higher the cost will be. Removing a shingles will cost more than adding another layer on top of pre-existing shingles. Asphalt roofs are the most common roofing systems in the US. 73% of homes in the US use asphalt shingles. Asphalt shingles are made of fiberglass coated in granules. They often last 20-25 years, are the cheapest roofing material, and are the easiest to install. Asphalt allows homeowners to apply a second (or sometimes third) layer of roofing. This saves the homeowner teardown costs. The average cost of material for a do-it-yourself roofing project nation wide was $1,510. You have a 50% chance of having your DIY roofing project run between $680 to $3,700 for an asphalt shingle roof. The average cost for materials and installation from a professional roofer was $3,350 in the US. You have a 50% chance of having to pay anywhere from $1,700 to $8,400 for a professional roofer to replace your roof. Removing an old roof costs anywhere from $3 to $5 for a square foot to $40 to $80 an hour and is the most difficult task in roofing. Its easy to install a roof yourself but you’ll need to make sure its installed in accordance with the manufacturer’s guidelines or else the manufacturer’s warranty will be nulled. This is also true for insurance claims. The extra $1,840, on average, you’ll pay to have a professional install your roof is worth it to be able to claim the warranty and your insurance. Tile roofs give homes a nice Mediterranean look. Tile roofs, often seen in the South West, Mediterranean, and Europe, offer a unique look with low maintenance and a very long (50+ years) life span. Some homeowner policies might offer a reduced premium if the homeowner installs tile roofs. The average cost for tile roofs in the US is $14,325 with a 25th percentile at $7,650 and a 75th percentile at $21,000. Although expensive, their aesthetics, durability, and dependability makes them a great investment. Metal roofs can be painted any color. Metal roofs, a new type of roofing that came in the 1950’s, allows homeowners to have a maintenance free roof with a unique look and plenty of color options. Most metal roofs can be painted in any color. Copper metal roofing is available and results in a very appealing roof. The average price for a steel roof is $13,550 with the 50% middle being from $5,100 to $22,000. The average cost for an aluminum roof is $18,050. Your cost will range from $11,900 to $24,200 for the middle 50%. 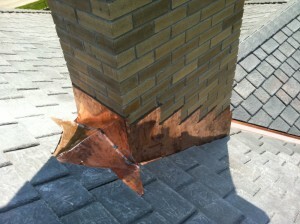 The average cost for a copper roof is $32,550 with the middle 50% ranging from $25,500 to $39,600. Metal roofs can be installed on top of a pre-existing asphalt roof to reduce costs. Their durability makes them a great long term roofing option. The average price, nation wide, for a roof repair is $649. This number came from a sample size of over 24,000 jobs. 50% of homeowners spent anywhere between $319 to $1,011 on their roof repair. The average price for North Carolina is $438 with most homeowners spending anywhere between $233 to $652. Repairing a roof costs less when the leak is spotted early. Call Roofing Roger to have your roof fixed now before the problem gets any bigger. The average nation wide cost for roof cleaning was $400 with most homeowners spending anywhere from $271 to $529. This number was obtained from a sample size of 1,900+ homes. The average price for North Carolina was $459 with most homeowners spending between $390 to $602. Roof cleaning gives your roof a new life, removes any growth, and increases curb appeal. How much does a roof inspector cost? The average cost for roof inspection, nation wide, was $230. This number came from 800+ jobs across the country. Most homeowners, the 25th percentile to the 75th percentile, spent between $124 to $338. The average cost for a roof inspector in North Carolina was $257 with most prices ranging from $251 to $271. $700 for a special use permit in Fayetteville. How do you choose a roofing company? When you’re searching for someone to do a roofing job, make sure you contact, interview, and get quotes from at least 4-5 companies. A roof is a vital part of your home and an improper roof can result in much, much more expensive damages which your homeowners insurance might or might not pay. Its always best to avoid low-balls as “cheap” is never a good route for roofing. Here are questions you should ask every roofer, written by roofers, and why its important. Is he or she licensed? In the state of North Carolina, one does not need a license when roofing a project under $30,000. Chances are, your roof’s cost won’t come close to $30,000. Jobs over $30,000 will require a general contractor license. These come in three types, limited, intermediate, and unlimited, and require the company to have $17,00, $75,000, or $150,000, respectively, in working capital. A limited license allows bits up to $500,000. A intermediate license allows bids up to $1MM. An unlimited license has no ceiling. Does he or she have workman’s compensation insurance? The law requires a company with 3+ employees to carry worksman’s comp insurance for all of them. However, as this law is hard to enforce, many companies who do not follow the law are getting away with it. If an uninsured company works on your roof and if a worker gets injured, you might be the one who’ll have to pay for his/her injuries. Avoid this at all cost. Notice how the metal flashing is above the shingles? That’s extremely improperly installed flashing. Get references from other homeowners to avoid unskilled roofers. Source. Can they provide you with 3 references from homeowners of houses similar to yours? There are many stories of poorly skilled roofers who improperly installed a roof and left the homeowner to pay for repairs or a new, properly installed roof. Your roof, valued around a few thousand dollars, is an asset you want to have dealt with properly. Do they provide a warranty? Warranties can come from the shingle manufacturer and/or the roofing company. Ask for how long is the warranty, what it covers, if its pro-rated, and get a copy of the exact contract. If you called 4-5 roofers, asked them those questions, and received 4-5 responses, you can begin narrowing down the choices. Grade each proposal from those 4 points along with their estimate. It’ll be best to throw out the low balls or overly high estimates. Going with a reasonably priced roof from an experienced, reliable roofer would be your best bet. This is how flashing is supposed to look. Source. Flat roofs – this is common on commercial buildings and some residential properties. Flat roofs last a long time and are easy to maintain. Common types are EPDM and TPO roofing systems. You can paint a flat roof with your company name and have it appear on Google Maps. Tile roofs – made from a wide variety of materials, tile roofs last a very long time (50+ years) and are a good roofing solution. They are to be avoided in high wind areas. Tile roofs generally cost more than shingles. Metal roofs – these roofs last a really long time (50+ and some are 100+) and are a great solution for homes as well as businesses. These can be painted in a wide variety of colors. They make a wonderful sound during rains. Green roofs – these roofs are new. They help reduce a building’s carbon footprint as well as reduce the temperature in the surrounding area. These are usually seen in commercial buildings in urban areas. Shingles – the most popular type of roofing system, shingles are affordable, low maintenance, and last, on average, 25 years. What are the concerns with skylights during roofing? Skylights can be a leaking point. Oftentimes, its hard to determine if a leak is due to a damaged skylight since humidity naturally builds up inside. Flashing and proper installation are required to make sure that the skylight works properly. How do I pick a shingle? Shingles come in many styles and colors. One should pick asphalt or organic shingles based upon their preferences. Wood shingles are to be avoided unless one’s looking for aesthetics over performance. Asphalt’s the most popular shingle type. Architectural shingles have a different look but come with a higher price. Oftentimes, after a severe storm hits an area, out-of-town (or sometimes even out-of-state) roofing companies would come by, going door-to-door, offering their services. These individuals and companies are called storm chasers. They visually inspect roofs from the curb, contact owners who might have roof damage from the storm, convince the homeowner how they can get a new roof with their insurance, and, if its a legitimate company, give the homeowner a good roof with the majority of it paid by insurance (the homeowner needs to pay his/her deductible). The issue is that, often times, the company will offer to “eat” the deductible. This means that they will reimburse the homeowner his or her deductible, making the roof repair virtually free. This sounds good and very tempting but, oftentimes, can be considered insurance fraud. Talk to your agent beforehand. There is also another issue with storm chasers: their workmanship can be unreliable. If the roof’s repaired or installed improperly, it’ll be hard to chase them down as they’re probably in a new city or state, chasing another storm. Avoid storm chasers. Here’s a news story about them. 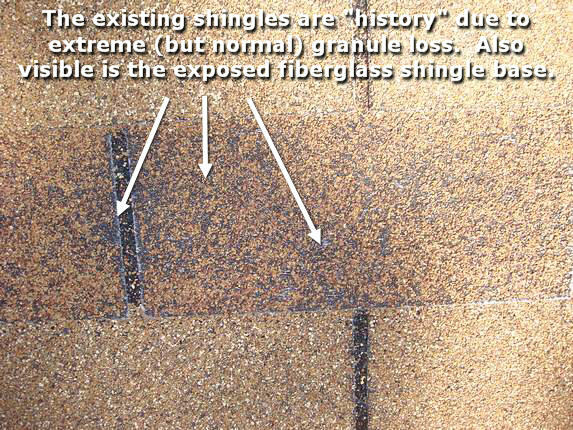 When shingles lose their granules, replace them. A roof can be damaged from a wide variety of things. Hail damage results in spots where the shingle’s fiberglass base is exposed since the hail blasted the granules away. Torn shingles are an obvious sign of wind damage. Old roofs can often see worn shingles with little structural integrity left. If a shingle can be easily lifted, its damage. The tar on the backside is supposed to stick to the shingles underneath. When can I install roofing? North Carolina has good roofing weather year round. Asphalt shingles require 50 degrees F or higher to seal properly. If you have highs in the 50’s, you’re fine. Some roofs say “40+ and rising for a week” as the sun will heat the shingles up as well but read your manufacturer’s instructions as proper installation is required to claim the warranty. Where can I go to learn more about roofing? The following resources will inform you about the ins and outs of roofing. This can be used to screen roofers or to install your own roof. There are many roofing organization. Below is a list. Local, state, and federal laws also govern roofing manufacturers, advertisement, claims, warranties, and practices. Check with your municipal for roofing guidelines. NRCA – this is the biggest roofing association in the US. NSA – this is the association for slate roofs. NERCA – this is the roofing association for the New England area. Canada’s roofing association – this is the roofing association for Canadians. Colorado roofing association – this is the roofing association for Colorado. EPDM Association – this is the association for EPDM flat roofs. Green Roofs – this is the association for green urban roofs. Who are notable roofing manufacturers? The following are large roofing suppliers. Some are produce only residential roofing systems, some produce only commercial, and some produce both. Some companies offer certification tests for roofers as well. GAF – one of the largest roofing manufacturers in the world. Henry – a maker of flat roofing systems. IKO – makes commercial and residential roofs. Tarco – makes a wide variety of roofing materials. 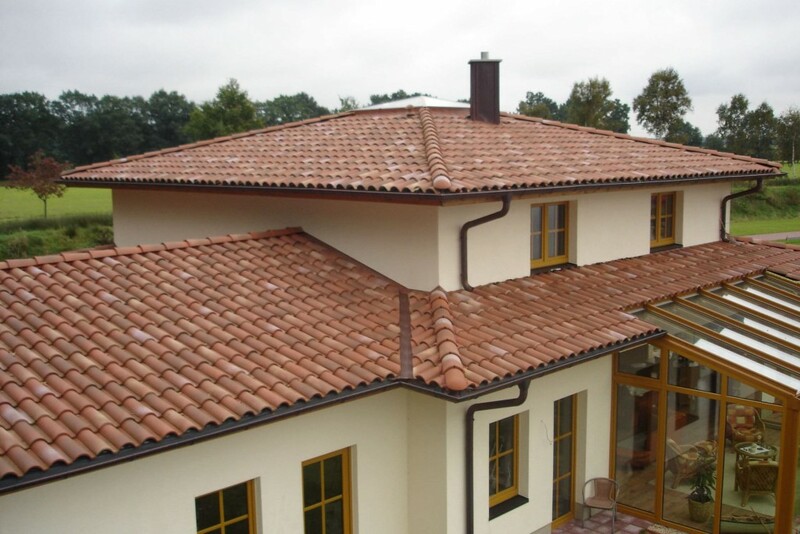 Tamko – also makes a wide variety of roofing materials. Siplast – makes great commercial flat roofing membranes. Polyglass – another roofing membrane manufacturer. Malarkey – great commercial and residential roofing solutions. Firestone – same brand as the tire company, they produce residential and commercial roofs as well. CertainTeed – popular with contractors. Atlas – another large roofing company. A roof’s price is a factor of many things, one of them is duration. The following are rough guides to how long a roof will stay in good condition before it needs to be replaced. Asphalt Shingles – 20-25 years. What should I do if there is a leak in my ceiling? Inspect your roof. How severe is the leak? Is there rotting wood? Is there mold? Where is it coming from? Is it coming from flashing that’s gone bad or has a piece of shingle blown off? Once the damage has been determined, give us a call, we’ll inspect your whole roof, and give you an estimate. What’s the Minimum Pitch for a Metal Roof? How much does it cost to roof a house? How wide is metal roofing?